"Colonel Harvey turned over to me the matter of the proposed contents for the new volume of the Hillcrest and Trade book ... The Colonel tells me that you are anxious that none of the articles shall duplicate." In September 1906 Harper and Brothers issued another collection of Mark Twain's previously published short stories and essays. Harper was also in the position of having to compile two separate versions of the book -- one for the "trade" to be issued in red cloth binding with gold cornstalks and one for the ongoing uniform edition subscription book buyers who had first purchased their sets from American Publishing Company back in 1899. By 1906, the American Publishing Company sets contained material that had not yet been incorporated in any of Harper's previous uniform series of books with red cloth bindings. With the publication of The $30,000 Bequest and Other Stories, Harper had the opportunity to even up the offerings. Clemens was concerned that neither series of books contain duplicate material. He approved the plan for the contents as laid out to him by Frederick Leigh who was overseeing the production of the new volume. The following chart compares the contents of both books. ** From Volume 22 of American Publishing Company's uniform edition titled How to Tell a Story, 1900. *** From Volume 23 of American Publishing Company's uniform edition titled My Debut As a Literary Person and Other essays and Stories, 1903. "The First Writing-Machines" - Harper's Weekly, March 18, 1905 - originally titled "From My Unpublished Autobiography"
Rounding out the volume are short pieces with composition dates ranging from 1865 to 1902. Some of the earlier material had appeared in the Galaxy, Buffalo Express, and Atlantic Monthly. "A Burlesque Biography" was actually a reprint from Mark Twain's (Burlesque) Autobiography and First Romance published in 1871 by Isaac Sheldon, Clemens's editor at the Galaxy. Four of the other stories had already been published by Harper as illustrated short books: A Double-Barrelled Detective Story (1902), Extracts from Adam's Diary (1904), A Dog's Tale (1904) and Eve's Diary (1906). At the time of its publication this book was quarreled with by the reading world as a hodge-podge; some of it taken from "Sketches Old and New," and even from the old Galaxy "Memoranda" published before 1871. The title led the world to believe that here was a new book by Mark Twain, for so it was advertised, and it was bought in good faith. Letters of complaint and censure came booming in, which Mr. Clemens replied to through me, referring the writers to Harper & Bros. who were the chief offenders (quoted in Messent, p. 187). Most contemporary reviews for the book, however, were positive. Although Clemens had an opportunity to revise and refine his work for The $30,000 Bequest and Other Stories, there is little evidence to suggest he took an active interest in doing so. "A Burlesque Biography" contains only a few minor technical revisions which make it different from the 1871 version found in Mark Twain's (Burlesque) Autobiography and First Romance. "Advice to Little Girls" is a slightly revised text of an earlier version which was collected in The Celebrated Jumping Frog of Calaveras County (Webb, 1867). However, no extensive comparisons between most of the essays and their previous printings has been conducted. This edition is printed by Harper & Brothers, the exclusive publishers of Mark Twain's works, as an accommodation to purchasers of earlier volumes with a view to making their sets uniform. It was up to the former buyers of the American Publishing uniform editions to continue adding volumes to their sets. However, as time went on, a number of buyers failed to continue collecting the books. Today American Publishing Company sets that contain more than 22 volumes are rare and those that contain more than 23 volumes even more so. Frank Bliss hired new illustrators for American Publishing Company's uniform editions begun in 1899. Artist and etcher William Harry Warren Bicknell (b. 1860 - d. 1947) was born in Boston, Massachusetts, the son of a grocer. Bicknell graduated from the Boston Latin School in 1878 and later studied at the Boston Museum of Fine Arts. He was a pupil of Otto Grundmann and Frederic Crowningshield. Bicknell's etching of the Tiffany monogram appears as a title page in every volume of the Autograph Edition, Edition De Luxe, Japan Edition, Author's De Luxe Edition, and the Royal Edition. Bicknell's engraved title page is present in Volume 24 of these editions but it is omitted from the illustration list. Thus, Bicknell's work is uncredited in Volume 24 for these editions. Mark Twain at his 70th birthday The frontispiece for all editions of Volume 24, The $30,000 Bequest and Other Stories, is an uncredited photogravure of Clemens taken at his 70th birthday celebration. Almost all of the original illustrations that had appeared in previous magazine publications alongside the stories collected in The $30,000 Bequest and Other Stories were eliminated including all of Peter Newell's wonderfully comic illustrations for the lead story. For those illustrations that were retained, none of the illustrators were given credit for their work. Illustrators whose works appear in Volume 24 include William Thomas Smedley, Albert Levering, Henry Louis Stephens, Lester Ralph, and Mark Twain himself. 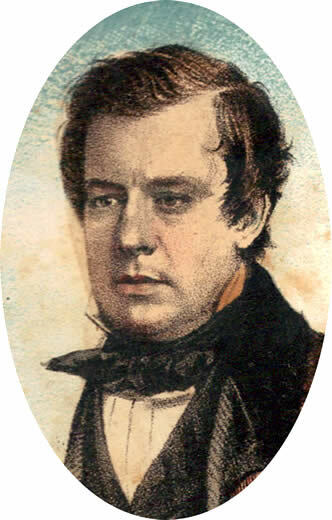 William Thomas Smedley (b. 1858 - d. 1920) was born in Pennsylvania, the son of a miller. At age fifteen he began working in a newspaper office in Chester County, Pennsylvania and later studied art at the Pennsylvania Academy of Fine Arts. He later was commissioned to travel through the Northwest with Lord Lorne of Canada. He also visited Hawaii, New Zealand, Australia and Paris where he studied under Jean-Paul Laurens. In New York he secured work with Harper's and Scribners. Smedley had provided six full-page illustrations for the 1899 uniform editions of The Gilded Age, Volumes 10 and 11. In 1903 Smedley provided four illustrations for Mark Twain's "A Dog's Tale" in the December 1903 issue of Harper's Magazine. In September 1904 Harper published the story as a slim 36-page book using the illustrations by Smedley. One of Smedley's full-page illustrations is featured in Volume 24. It is the only full-page plate inserted into the volume. 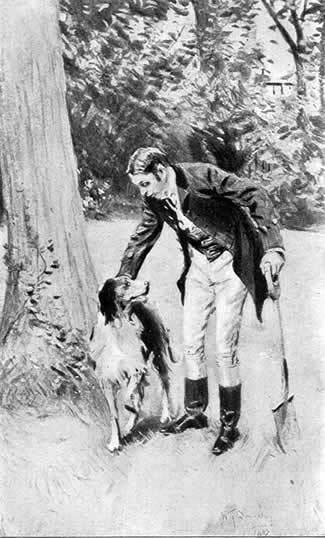 Smedley's illustration "Poor Little Doggie, You Saved His Child" from "A Dog's Tale" was one of four used to illustrate the story in Harper's Magazine, December 1903. 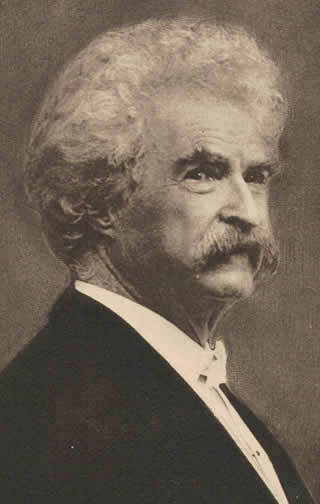 Levering's drawing of Mark Twain with an Italian-English Dictionary is present in Volume 24 but is omitted from the illustration list. Albert Levering (b. 1869 - d. 1929) was born in Hope, Indiana, the son of Levi L. Levering, a carpenter. The family later relocated to Kansas City, Missouri. Levering studied architecture and practiced that profession for eight years in San Antonio, Texas. He later abandoned architecture to become a newspaper artist. Levering worked for newspapers in Kansas City, Missouri as well as the Minneapolis Times and Chicago Tribune. In 1896 he moved to New York and worked on the staff of the New York Journal, Tribune and Herald-Tribune. He subsequently worked as a book and magazine illustrator on the staff of Puck, Life, Collier's, and Cosmopolitan. By 1903 he had a regular full-page feature in Harper's Weekly. Mark Twain's "Italian Without a Master" appeared in Harper's Weekly on January 2, 1904 with six illustrations by Albert Levering. The essay is the only one in The $30,000 Bequest and Other Stories that retains all of its original illustrations from the first printing (plus six photo reproductions of Italian newspaper headlines). In 1909 Levering drew the cover and frontispiece for Mark Twain's short book Extract from Captain Stormfield's Visit to Heaven. Henry Louis Stephens (b. 1824 - d. 1882) was born in Pennsylvania the son of William Stephens and Marie Picard Stephens. Stephens was one of the country's first political comic illustrators. Among his earliest work is The Comic Natural History of the Human Race published in Philadelphia in 1851 which features faces of prominent citizens perched atop animal bodies. Stephens included his own picture on a page titled "The Hen That Hatched This Egg." The book was produced in conjunction with John Cassin, curator of the Philadelphia Academy of Natural Sciences. Stephens also worked as an artist for the U.S. Exploring Expedition reports, many of which were published in Philadelphia. In the late 1850s Henry, along with his two brothers, Louis Henry Stephens (who shared the same names as his brother, although in reverse order), William Allan Stephens, and Henry's brother-in-law George Wevill, an engraver, relocated to New York. Stephens found work with Frank Leslie's publications and later Harper and Brothers. With funding from Frank J. Thompson, the Stephens brothers established Vanity Fair magazine, a weekly humorous newspaper, which issued its first number on December 31, 1859. 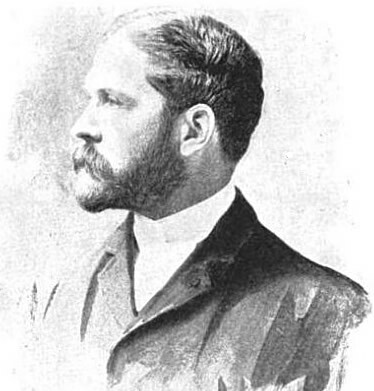 Henry Louis Stephens was the leading artist. George Wevill worked as the engraver and William Allan Stephens was managing editor. When Thompson sold his interest in Vanity Fair, Louis Henry Stephens became publisher for new owners William Camac and Henry Bonsall of Philadelphia. 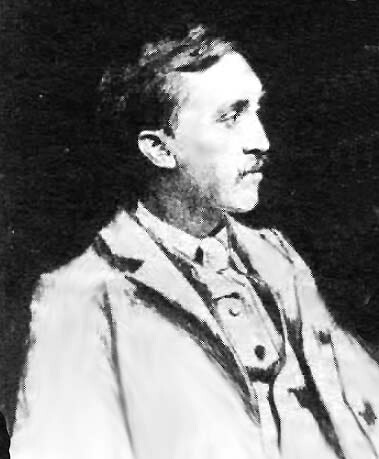 Charles Farrar Browne, known by his pen name Artemus Ward, was recruited for the position of assistant editor. Vanity Fair had a short life and issued its final number on July 4, 1863. In July 1865 Stephens helped establish the short-lived comic paper Mrs. Grundy where he worked alongside illustrator Thomas Nast. Mrs. Grundy lasted only eleven months. From April to December 1870 Stephens worked on another weekly comic paper established by his brother William Allan Stephens called Punchinello. Financial backers of the paper included Jay Gould and Jim Fisk of the Erie Railroad and William M. Tweed and Peter B. Sweeney of Tammany Hall. Punchinello occasionally poked fun at its benefactors, but the satire was only mildly amusing. The publication folded after the last issue on Christmas Eve 1870. 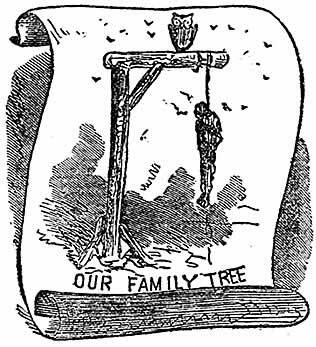 Henry Louis Stephen's illustration "Our Family Tree" originally appeared on the title page of Mark Twain's (Burlesque) Autobiography and First Romance. At the same time Punchinello was satirizing Gould, Fisk and the Tammany Hall crowd, Henry Louis Stephens provided caricatures of them in Mark Twain's poem "The House that Jack Built" featured in Mark Twain's (Burlesque) Autobiography and First Romance (1871). Twain's book consists of two other separate pieces in addition to the poem--a comic autobiography of Mark Twain and a short story titled "Awful, Terrible Medieval Romance." Stephens also provided one illustration titled "Our Family Tree" for the title page. It is Stephens's only illustration from Mark Twain's (Burlesque) Autobiography and First Romance that appears in Volume 24 The $30,000 Bequest and Other Stories. Stephens also provided unsigned illustrations for the first edition of The Gilded Age issued in 1871. Stephens achieved distinction later in his career as a watercolor artist. He died in December 1882 at the relatively young age of 50 after complications from diabetes had left him blind for several years. Lester Ralph (b. 1876 - d. 1927) was born in New York, the son of noted New York journalist Julian Ralph. He studied art in Paris at Julian's and at the Slade School in London. When war between Greece and Turkey broke out in 1897, he covered that conflict for the London Times. During the Boer War, 1899-1902, he traveled to South Africa as a correspondent again for the London Times. In 1906 Ralph provided 55 illustrations for Mark Twain's Eve's Diary for Harper and Brothers. The 106-page book featured Ralph's full-page illustrations on every other page. The book was, in part, a tribute to Clemens's wife Livy who died in 1904 and Clemens wanted the illustrations to be elegant and graceful. He was pleased with Ralph's drawings in spite of the fact that one library banned the book because Adam and Eve were depicted naked. Two of Ralph's full page illustrations from Eve's Diary appear in Volume 24 of the uniform edition of Mark Twain's works. Lester Ralph died at age 48 in New York after an operation for appendicitis. His obituary in The New York Times recalled his work on Eve's Diary and the pleasure Mark Twain took in them. Lester Ralph's depiction of Adam from "Eve's Diary"
Mark Twain - Two of Mark Twain's own comic illustrations from earlier magazine contributions appear in Volume 24. "Amended Obituaries" from Harper's Weekly, November 15, 1902 features his own caricature of himself. Volume 24 also features "Portrait of King William III," a reprinting from the Galaxy, January 1871 which features Mark Twain spoofing his own artistic abilities. Overall, the attention that Harper gave to illustrating Volume 24 The $30,000 Bequest and Other Stories pales in comparison to the previous efforts Frank Bliss and American Publishing Company had devoted to the first 23 volumes in the uniform editions. The following are the illustrations that are present in all editions of Volume 24, The $30,000 Bequest and Other Stories from 1906 to 1917. Harper's red cloth with gold cornstalk first edition features these illustrations plus six additional ones for stories not included in Volume 24. From 1906 until mid-1917 the contents of Volume 24 remained the same. In mid-1917 Harper revised the contents of The $30,000 Bequest and Other Stories for a new printing of the Author's National Edition. This reshuffling of material is one source of confusion for book collectors who often try to acquire replacement volumes for incomplete sets. The task is further complicated due to the fact that the bindings for a number of years were extremely similar even though the contents were different. Harper edition of Vol. 24, The $30,000 Bequest with printing date of A-R (January 1917) retains the original 1903 table of contents. Harper edition of Vol. 24, The $30,000 Bequest with printing date of B-T (February 1919) features different contents. The following table details the shifting contents of Volume 24. Items in bold are unique to the particular volume. The 1917 reshuffling of content for the Author's National Edition eliminated the duplicate stories and placed related stories together in the same volume. "Albert Levering, Illustrator, Dead," The New York Times, 15 April 1929, p. 22. Branch, Edgar Marquess and Robert H. Hirst, eds. The Works of Mark Twain: Early Tales & Sketches, Volume 2, 1864-1865. (University of California Press, 1981). Hancock, Ernest L. "The Passing of the American Comic," Bookman, Vol. 22, September 1905 - February 1906. Online via google books. "Henry L. Stephens's Work," The New York Times, 6 September 1902. Kingman, L. W. "Comic Periodicals of America," The American Bibliopolist, December 1875, pp. 264-265. Online via google books. "Lester Ralph, Artist, Dies After Operation," The New York Times, 6 April 1927, p. 27. Matthews, J. Brander. "The Comic Periodical Literature of the United States," The American Bibliopolist, December 1875, pp. 199-201. Online via google books. _____. "Some American Periodicals: Rambling Impressions of a Literary New Yorker," New Outlook, 12 September 1917, p. 50. Online via google books. Mott, Frank Luther. A History of American Magazines, 1850-1865, Volume 2. (Oxford University Press, 1970). Online via google books. _____. A History of American Magazines, 1865-1885, Volume 3. (Oxford University Press, 1970). Online via google books. "Obituary: Henry L. Stephens," The New York Times, 14 December 1882. "Obituaries: Levering, Albert." American Art Annual, Volume 26, 1929, p. 391. Stone, Witmer. "An Anonymous Work of John Cassin," Auk, Volume 38, April 1921, pp. 286-87. Online via google books. Twain, Mark. The Celebrated Jumping Frog of Calaveras County. (Oxford University Press, 1996). _____. The $30,000 Bequest and Other Stories. (Oxford University Press, 1996). _____. The $30,000 Bequest and Other Stories. Volume 24. Hillcrest Edition. (Harper and Brothers, 1906).